We developed this recipe for ribs, but it’s also a winner with steak. It gets its depth of flavor from molasses, its tang from cider vinegar and lemon juice, and its kick from ancho chiles and ginger. This is one dynamic sauce―and it goes really well with spareribs and brisket too. Bless the Argentines for coming up with chimichurri sauce, an intoxicating blend of herbs, vinegar, and garlic that tastes wonderful with beef (another Argentine specialty). This recipe suggests pan-cooked ribeyes, but you could grill them just as easily, or substitute your favorite steak cut. A classic sauce that couldn’t be easier―just butter, mustard, wine, and Worcestershire. 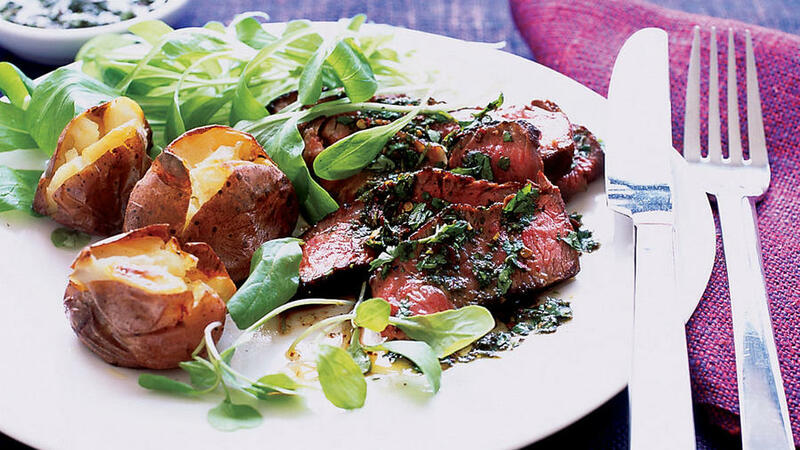 As your skirt steak sizzles on the grill, your sauce cooks right next to it in a pan; then you eat them together with some spicy watercress, if you like. Rich with velvety guajillo chiles and fragrant with cinnamon, oregano, and cloves, this Mexican-style sauce works very well as a marinade, too. This aromatic mix of smoky toasted chipotle chiles, peppercorns, and cumin makes for steak so lively it’s practically dancing. We’ve blended together a classic mix of dried herbs, spices, dry mustard, and paprika here. Try it on brisket too. Created especially for steak, this simple rub brings out the succulence of the meat. Squeeze an orange over the steak when you’ve finished grilling, and season it with good coarse salt.